The Reader brings together over forty key texts on the British newsreels, from their silent beginnings to their revival as the ingredient of television documentaries. The texts come from trade-papers, memoirs, parliamentary debates,newspapers articles, publicity brochures, film reviews and academic essays past and present. 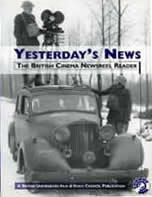 The Reader documents how the newsreels were produced, how they were received, and the controversies they inspired through the conflicting demands of news and entertainment. It covers filming of two World Wars, from the invasion of Belgium to the liberation of Belsen; the Spanish Civil War; the rise of television; and enduring arguments over censorship, propaganda and political bias in the news. It documents their organisation, the cameramen’s experiences, and the overlooked role of women in the newsreels. It covers the academic interest they have aroused, with classic studies and the best of research taking place today.Outrageous and conservative, cowardly and courageous, impartial and manipulative, in all things entertaining the newsreels documented their times with gusto. Their sense of the news was often suspect, but their sense of what the audience wanted and understood was acute. It was that popular sensibility that kept them in the cinemas for decadess. This Reader revives the spirit of a richly rewarding medium. Price £39.00 (£29.00 to BUFVC members) plus £2.50 postage and packing within the UK, £6 elsewhere.